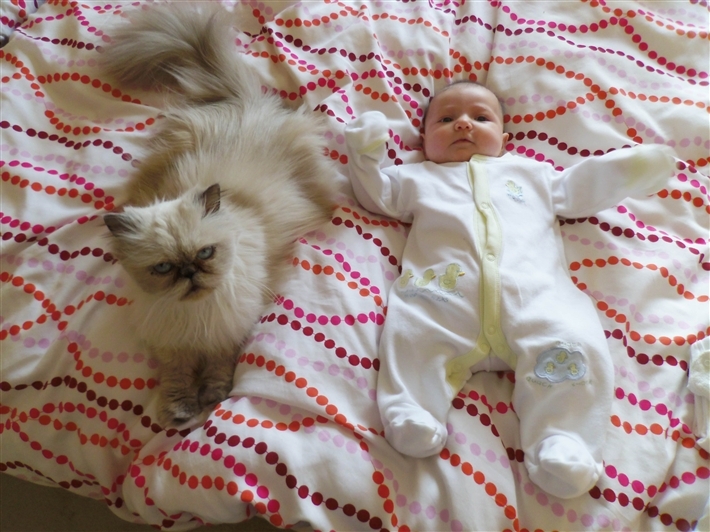 Leanne Pilbeam talks about how she introduced her cats to her new born baby. I grew up with a cat, and as an adult we have always had cats in our household, so when I fell pregnant I began to think about the way forward. Having worked on the reception at Cats Protection for a long time I was used to frequent calls saying, “I’m having a baby so I need to rehome my cats”. There are still a lot of people who see pregnancy as a reason for rehoming their cats, but I did not (and still don’t) see why the two are mutually exclusive. I began to research how best to tackle the issue and the best piece of advice I came across was to get the house and the cats ready for a baby and the new routine BEFORE the baby arrived. So once I had had my 12 week scan and I knew everything was ok we gradually started adapting the house for our baby. We cleared the nursery and started shutting the cats out of that room. We bought covered litter trays to replace the open ones. We gradually moved the litter trays to areas of the house where the baby would not be (we put one in the downstairs toilet and cut a cat flap in the door!) so the cats could do their business in peace. We cleared special sleeping areas for the cats up high and in the bedrooms. We got cat nets for the moses basket and cot and we set everything up for the baby. As this was done over time and before the baby arrived the cats had time to get used to it and adapt to all the changes. When Russell was born it was a difficult birth and we were in hospital for a few days so when we finally got home the cats were quite unsettled and upset. They were also terrified of Russell! We tried our best to reassure them and give them attention and over time they settled and got used to our new arrival. We always encouraged the cats to spend time with Russell - to smell him and rub up against him, and we encouraged Russell to try and stroke the cats from as early as we could. I believe it is important to encourage positive interactions. If you are always trying to keep them separate then that is when tensions can arise. I think it is also important to make the cats feel involved and a part of the new family, as the feeling of being pushed out or replaced can also lead to behavioural problems from them. Now Russell is two and a half years old and having the cats, I believe, has enriched his life. He has learned to be gentle and considerate to them. It has involved constant reminders on my part not to chase them / sit on them / grab their legs, but he is really starting to understand now. He helps me call them in at night, gets the cat food out the cupboard and he helps me put the food bowls down for them. When our cat, Whiskers, was unwell recently and had to go to the vets he helped to look after her and he was constantly checking she was ok. The cats are still a bit wary of Russell and more often than not they will retire upstairs away from all the noise, but more and more often now we are finding them snuggled up with Russell enjoying a big cuddle or tickle. There are lots of old wives tales warning about cats while pregnant or with babies, and if I had a pound for every time someone said to me, “Are you going to have to rehome the cats now?” I would be a rich woman, but my advice would be to at least give it a go. I believe having cats has helped with Russells emotional development in many ways, and also with his speech development. On a wider note, if we can bring up the next generation of children with an inbuilt kindness and compassion for animals and an understanding of their needs surely this can only be a good thing. Joel Scott describes how he introduced his new baby to the family's Persian cats. When my wife Charlotte and I found out we were going to have a have a baby, it really was the most superb news I had ever heard and although really exciting, it hit me how much our lives were going to change. Almost instantly I got onto estate agents so we could find a bigger property and started working out budgets for our new son or daughter. I then wondered how Penny and Pepper our two other ‘daughters’ would take to the new arrival? Penny and Pepper are our two splendid Persian cats who are both three years old. Penny was our first arrival when we moved into our flat and quickly became Daddy’s little girl! She doesn’t mind mum but always directs her attention to me. Pepper is a very happy go lucky girl and takes everything in her stride. She’s a lot tougher character than Penny, although I’m sure Penny is the boss. As I spend quite a lot time trying to educate youngsters about cats, I believe it is vital that children grow up with animals; it teaches them care, respect, love as well as many other things. We have many cats brought into Cats Protection because of new babies, which is a real shame because with a little thought and organisation both cats and kids can live happily together. After my wife became pregnant, Pepper became very attached to Charlotte’s belly. As soon as she sat down Pepper was there snuggling up to her and she seemed to sense something was going on. Penny acted very much as always, cuddling her Dad! As we started to organise the nursery, the cats were very interested by all the new baby equipment and started sniffing and rubbing everything just to make sure it was safe! Pepper likes to get in things like boxes, bags and anything she can fit into really and instantly took a liking to the Moses basket! Our way round that was to cover it with a net, she didn’t take any notice of it then. Baby Evangeline Hope Scott was born on the 25th Feb and it was the most wonderful experience of my life. I thank God for our daughter and my wife’s effort and determination, she really inspired me. Charlotte was in hospital for a couple of days so I had to nip home from hospital to feed the cats, clean their litter trays and give them a fuss. When Charlotte and Evangeline came home, I was delighted how the cats took to having the baby around; they didn’t mind the crying and Pepper even upped her maternal ways, becoming extra cuddly! As always I kept up good litter tray hygiene, washing my hands regularly and at night keeping cats in the living room and kitchen separate from our bedroom. We haven’t had an issue with the cats getting in the Moses basket but it is sensible to be vigilant, I’m sure they would soon move if Evangeline started screaming anyway! It is important to provide places for the cats to hide (which was under the bed for Pepper) and plenty of toys and enrichment. Litter trays, food and water bowls should be placed in quiet places. Cats are creatures of routine, so keeping in a routine helps them settle with a new person or animal. We have now moved to a larger house and have taken on another Persian, Matilda who is a very playful three year old tortoiseshell. We have all settled in nicely and and we have had no problems with cats getting in Moses baskets, toileting issues, or any other problem and we are very happy with how things have turned out. Children really do benefit so much from having animals in their life, if you are worried about your new arrival and existing cats, please do not hesitate to contact the adoption centre, we can hopefully offer you the support you need. Thanks for reading, Joel, Charlotte, Evangeline, Penny, Pepper and Matilda!